Finally, finally, finally, I DID IT! My “PATH TO THE MARATHON” is complete. 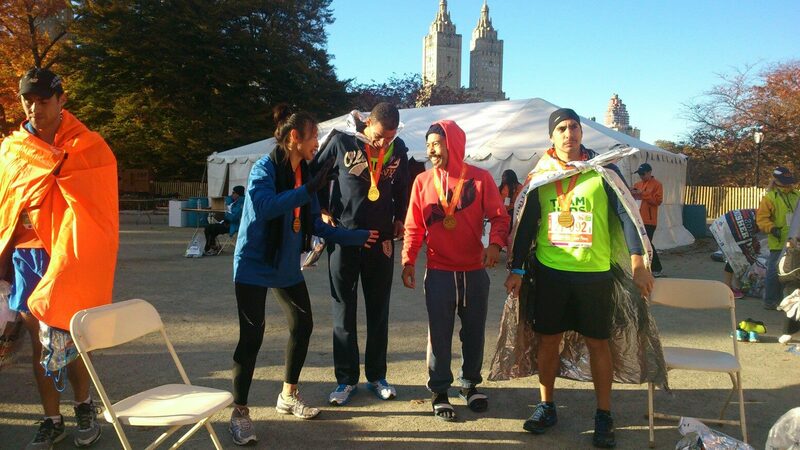 I finished the New York City Marathon and conquered the 5 boroughs with 50,000 other crazy people. 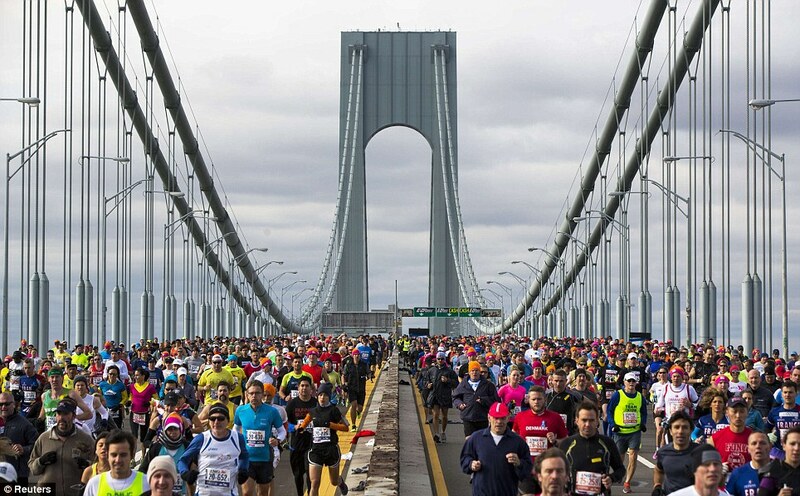 It was the largest marathon in the history of marathons in terms of the number of runners. Everything for the past 2 years (including this blog) all led up to this one moment on Sunday November 3rd. Running a marathon is the hardest thing I’ve attempted physically. It was more than a race, it was the craziest “parade” that I’ve been a part of. Such an event needs to be experienced to be truly understood and appreciated, and there’s only one way to find out. Well, it took 2 years, but now I can finally share what it was like for me, an amateur NYC marathoner (it feels great to say that I’m a marathoner now). November 3rd, 2013. 10:05AM (WAVE 2) and 45 degrees. Around 50,000 finishers. The day started early, really early. I woke up at 4:15AM, ate breakfast, got dressed, and left at 5:30AM to get on the subway. Oh great, my train to Manhattan was rerouted, so I ended up taking a cab and lucky I found one. I arrived just in time to get on one of the express TeamForKids buses which leave at 6:30AM sharp. This was a major perk for raising money for this charity group last year. With so many buses headed to Staten Island along with unexpected traffic in South Brooklyn, it took about an hour to get there. And then, I saw it, the Verrazano bridge; the starting point of the 26.2 mile journey. Soon, I’ll be running on that bridge just like I’ve always imagined and dreamed. The buses dropped us off and all you could do is follow the herd of runners into the starting village. You immediately feel the temperature difference, like 10 degrees colder than the city. Also, it was very windy, which makes crossing bridges so much tougher. As far as the eye can see, there were runners on the ground looking like homeless people or in tents trying to stay warm. There were various languages coming from loudspeakers, a reminder that this race has runners from all countries. I wished many fellow WAVE#1 runners good luck as they lined up first. After my WAVE#2 group stretch, I proceeded to line up right after the WAVE#1 runners started their journey. With one last bathroom break and a bit more walking with the herd to the actual start line, I was standing on the bridge. The cannon fired. It’s actually happening! It’s marathon time! 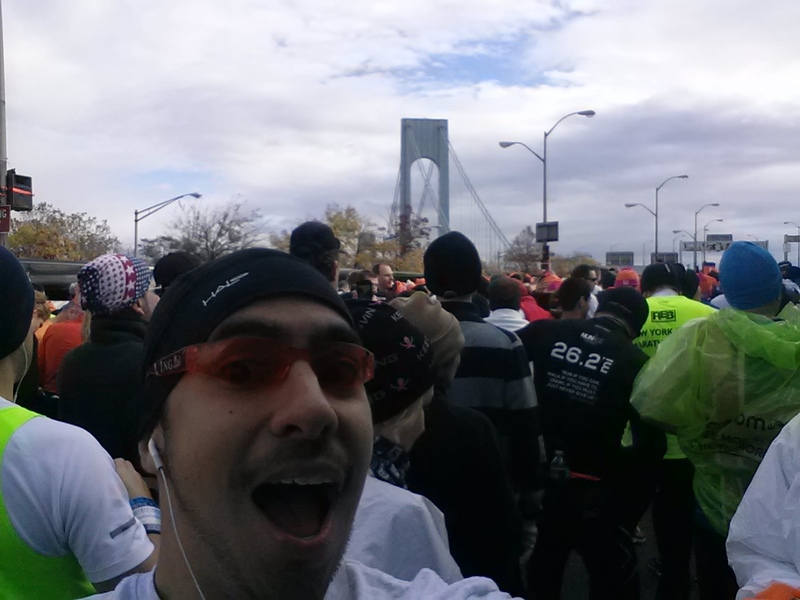 Aside from the finish line, crossing the Verrazano bridge was the greatest experience for me. I wished it could last longer than it did, although it’s the longest bridge in America. My fastest mile was running down that thing (7:20 pace, such a fool, a happy fool). 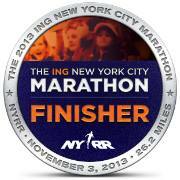 My only thought was “I’m running… the NYC Marathon, YEAAA”! It was such a thrill and great feeling. Helicopters were everywhere, one was close enough to jump off the bridge and grab. And there I am on the right lane toward the back wearing a neon green tank top; the only guy running on that elevated platform in the middle doing hurdles over tossed clothing. After the bridge, we entered South Brooklyn. For the first hour, I was feeling great, giving high fives to strangers, and running strong at almost record 10K race speeds. Although I had my earphones on, I realized that it made no sense in certain areas since the crowds were much louder. Every mile had a few block parties with a band or DJ blasting music. There were so many funny signs and people dressed up in Halloween costumes. There were people shouting though their windows and rooftops. With so much entertainment on the course, a whole hour passed by quickly. By the second hour, we were in North Brooklyn, and it was even louder. Neighborhood after neighborhood, people were out cheering and partying like it was New Years Eve. Running through Brooklyn was awesome and I enjoyed it. Somewhere around mile 10 in Williamsburg Brooklyn, I had this nasty stabbing side cramp that lasted for 2-3 miles. Nooo! I had to slow down a bit and control my breathing. By this point, it’s been 8 hours since I’ve eaten, and I started to feel the fatigue much earlier than usual. This was the big mistake which made things tough for me during the second half of the race. Crossing the Pulaski bridge into Queens was the halfway point, and I just couldn’t resist a walking break. Uh oh, do you know what that meant? It’s a sign of fatigue and it was way too soon for that, things were about to get ugly in a few miles. At least I was still on point for a 4 hour marathon with 1:55 at the halfway point. Once in Queens, I knew the monster was coming soon; the Queensborough bridge. Using reserve energy, I was running a minute per mile slower than usual and took a stroll through each water station. Even though I trained on this bridge many times, my performance was the worst ever. I had to power walk 4 times going up the bridge, Ugh, such a failure. At least there were no crowds on the bridge to witness me burn out, and I wasn’t alone. There was literally a walk-of-shame lane on the right side, haha. Suddenly, I had a surge of energy going down the bridge and into the city where the liveliest crowds were having a welcoming party for the runners. It was truly a sight to see the sea of people on 1st avenue. Entering the city is considered the highlight for many runners. There was people everywhere, pure madness. My reserve energy ran out 2 miles later and by mile 18 around 96th st, I was toast. I officially hit the wall with 1/3 of the journey left to complete. Walking felt so good at times, I totally didn’t care if the crowds saw me walking every few minutes. As I said goodbye to my 4 hour time goal, I started to worry if I would finish at all. The new goal was to survive. With a bad case of the walksies, I entered the Bronx. My pace dropped by 2-3 minutes each mile. Runners were dropping like flies. Some stopped on the side to go stretch, others ended up in the walk-of-shame lane. And then OUCH, it felt like a dog bit my hamstring. I felt an unfamiliar and nasty pain which almost made me fall. My neck was sore from holding my head upright. I spilled Gatorade on myself and slipped on banana peels. I was falling apart. But I didn’t come this far to not finish this thing. Like a prisoner with leg cuffs, I shuffled my way over the last bridge and into Harlem. I hate it when people yell “almost there”! There are miles between me and the finish line, almost there? C’mon! I dragged my tortured body through Harlem and down 5th avenue until I reached Central Park. Block after block, people yelling, runners everywhere, and pain all over. My only thoughts were “never again”, and “this is the last one”. Central Park was mostly downhill, so I managed to shuffle my feet long enough to get to mile 25. With one more mile left, I finally knew it was possible. The end is near and it can all be over in 10 minutes! Somehow, my body felt numb, and I ran without pain. Was I on the verge of passing out or was I about to become a marathoner? Whichever one comes first! The finish line is right up that hill, you can do it, you have to! Do it once and for all! VICTORY! It took 4 hours and 34 minutes but I didn’t care about the time much. I just ran the NYC marathon and it was unbelievable. The medal meant nothing, the battle was everything. This was more than a bucket list item checked off, it was a childhood dream come true. My legs muscles are still sore as I write this sentence 3 nights later. And you know what’s harder than running a marathon? 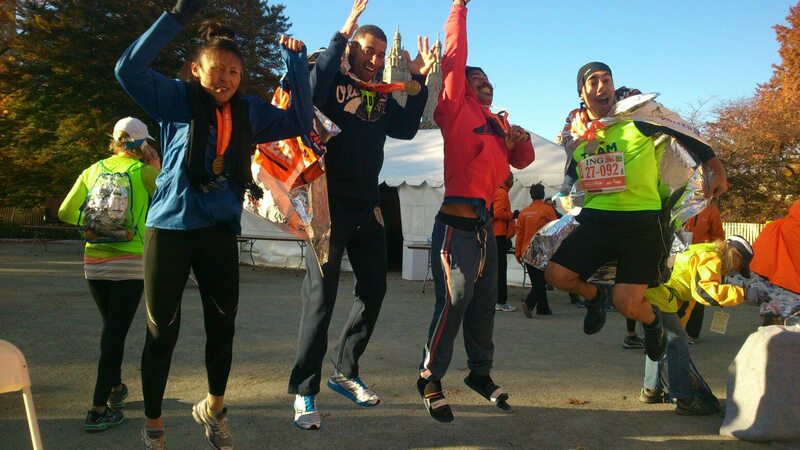 Taking “jump” pictures with the wolf-pack after running a marathon. A big thanks to everyone who trained with me (coaches, friends, wolf-pack), those who supported me with last year’s fundraising, those who believed in me, and especially my wife who was there since day one. If you had asked me during that Sunday evening to run another marathon and put myself through that roller coaster ride again, I would have answered “HELL NO, NEVER AGAIN”. 24 hours later, I thought it over, and now the answer is “I WANT A REMATCH”! I felt every feeling in the spectrum in the following order: prepared, nervousness, thrilled, excitement, happy, tired, doubtful, worried, disappointment, exhaustion, pain, anger, depression, helpless, numb, hopeful, rage, relieved, accomplished. Well, after 2 years, The Path To The Marathon is officially over. But my posts will still continue. There are many paths to take now. I may have survived a marathon but I didn’t conquer one. I’ll be better prepared next time. Also, there is a mountain waiting for me in August. The Path to Mount Rainier?